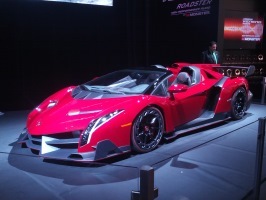 Today, I visited CES 2014. (You can read my notes from last year here here). I was only at the show for one day, and there is only so much one can see in just a couple of hours. This is not supposed to be complete list of everything exciting announced or visible at the show. It’s a compilation of things I was able to see at the show and thought cool enough to write about. 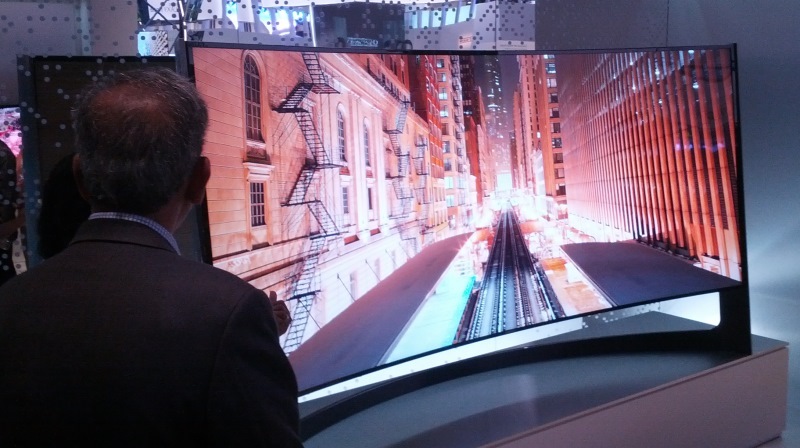 CES, is not CES without big screen TVs, so let’s get this out of the way first. 2014 did not disappoint. There were acres of bright flat (and not so flat*) screen TVs on display. If you weren’t showing 4K OLED devices this year you might as well have just packed up and gone home. 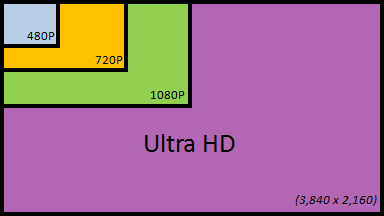 4K (also known as Ultra HD) is the next standard in high definition TVs (equivalent to 4x the current top of the line 1080p devices), and these devices were everywhere. It’s not even worth talking about sizes any more. They are available in all sizes for XL to XXXXL (depending on your budget). 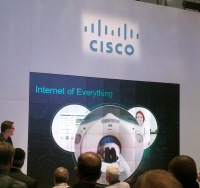 For the record, the largest device I saw at the show was 110” (I’ll take two please). *The trendy thing this year was curved displays. No longer do manufacturers want to make them thin, then want to bend them around virtual cylinders to give them a curve. Drinking the Koolaide, this is supposed to give them a more ‘natural’ viewing as there is less aberration (all points of the screen being, now, approximately the same distance from your head), plus less glare. It is more 'immersive'. I don’t know about you, but I don’t live in a lighthouse, and I don’t have a curved wall. If I bought one of these TV’s I think it would look a little strange mounted on the wall; peeling off on both edges. I think I’d like my TV flush against the wall. This problem, however, was solved by a device demonstrated by Samsung, with "The World’s First bendable flat screen TV" (I kid you not!) I don’t know how practical it is, or whether it will make it into main stream production, but it certainly scored very high on the Geek scale. One minute you’re looking at a flat screen TV, flush with the wall, then a push of a button, and five seconds later, your TV bends to into a curved screen TV. Yes, the front of the screen is made from flexible glass! Very clever. Next door to it, Samsumg were also showing a 8K TV demonstrator sized at 98” (QUHD is a phrase I think I heard them call it), plus a really nice ultra-wide aspect ratio display 21:9, in 105" size (shown below). Overall, Samsung hosted a great booth (I’ll talk a little more about them later), and they take joint first place in my personal (arbitrary) rating of the best of show. They share my 'best of show' honor with LG who always seem to put on a good show. 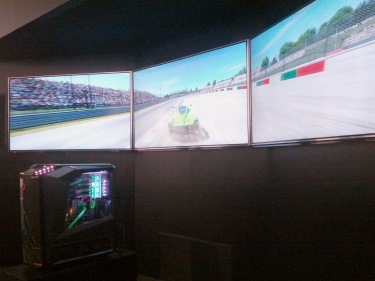 The LG booth always knocks you out with a Wow, and this year was up to their usual standard. A huge wall of (I think 140, arranged 20x7?) 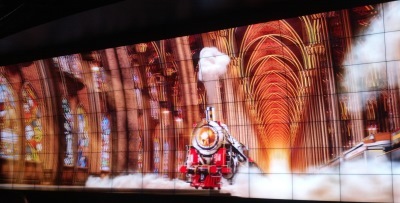 massive displays were tiled to create an enormous giant wall of 3D images (glasses were provided). It was not just the spectacle of the size, the content displayed on this wall was awesome. I stood there, gasped, and watched the entire demo loop in glorious super-bright and super-crisp 3D. My photo, above, of course, looks blurred, since it captured both sides of the 3D image, but I wanted to pay homage. For the record, LG were also showing all the appropriate mix of UHD, curved, curved 3D, curved UHD 3D, 21:9 ratio curved … etc. devices too. They covered all the bases with their displays. Panasonic, like everyone else, were not only showing curved UHD devices, but they were also showing some convex curved displays! 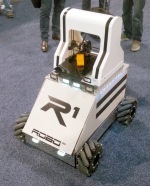 OK, this is pretty cool, and a great technology demonstrator, but it has to be the smallest of niche markets. I could be sold, potentially, the benefits of the concave curved display, but all the benefits of curve go out of the window with convex. Heck, if I had one in my living room, I’d not be able to see the edges if I stood in front of it! Yes, the device has artistic benefit if you are creating a wall of video with depth, like the image above, but this is not applicable for consumers, and this is the Consumer Electronics Show after all. 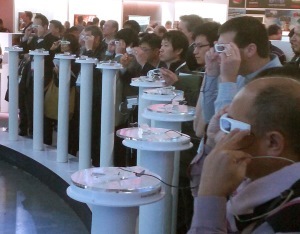 A few people were showing ‘glasses-less’ 3D TVs. Devices where, if you stood correctly, you could see a 3D stereoscopic image without the need to use polarized glasses. The technology is getting better; it’s no longer like looking at those stickers you used to see on the back of breakfast cereal boxes, but it’s not really prime time consumer technology, and image quality is still poor. Social TV was a buzz phrase attempted by a couple of the manufacturers, but all this meant was a split screen with the TV show in one window, and a Twitter feed scrolling by in the other (or, I was told, the ability to Skype with someone you were virtually watching the TV show with. Even the people talking about this were not convinced enough about this concept to include it actually working in the demo, and stuck to showing a scrolling Twitter). One of the people doing the demo saw my facebook lapel pin and said, “oh, and of course, you can also update your facebook status in this window too whilst watching the game”. That’s not a fantastically compelling use of social technology, IMHO (“Come around to my house, and watch TV, and whilst we’re watching the same show, I’ll view and update my status page in this window on the side”). Now, if they linked back to your profile, and found other friends who were watching the same show as you, or looked at your interest graph to suggest shows to watch or friend recommendations, or links to fan groups of the show, that would be a better use of the technology. On display were the usual mix of form factors of new devices. A few items stood out. LG were showing a neat larger format Android phone with a curved glass screen. If you cradled it in your hand and tilted it ‘backwards’, you panned upwards on a virtual screen to see icons off the top of the display. Similarly, tilting the device ‘forwards’ gave you access to icons off the bottom of the screen. I’m describing it clumsily, but it worked naturally and fluidly when I tried it. 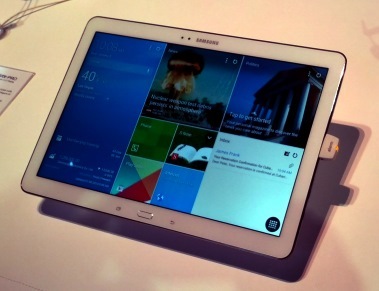 Samsung were out in full force with a whole family of new Note products (In three sizes: 12.2”, 10.1” and 8.4”). These devices were stunning. They had super crisp displays (2560x1600), and sported quad-core processors. No mention of price, but I liked them a lot. Sony put on a great booth again this year. 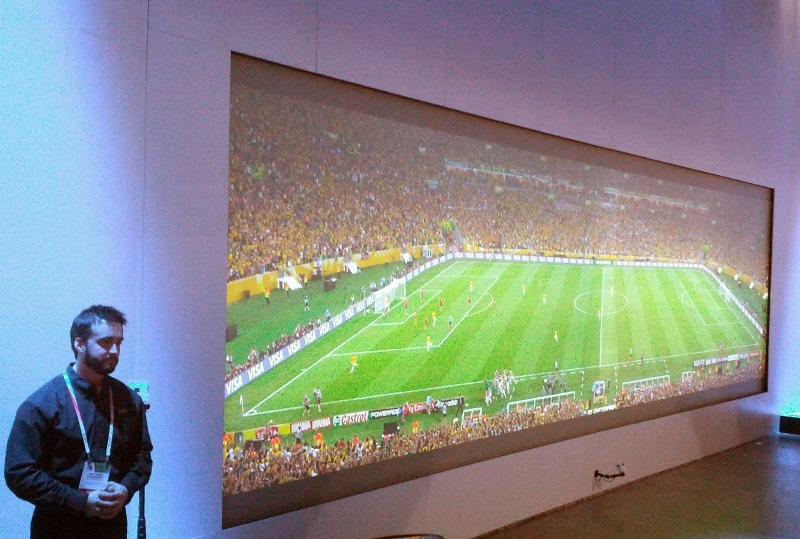 At the rear of the booth they were showing an immense projected UHD display of FIFA soccer. Super impressive to see. It was a whopping 32’x9’ (will America ever go Metric?) in size. Even more exciting, in front of the display was a long line of people queuing to try on a pair of ‘Smart Glass’ devices. Oh yeah, this is going to be Epic! The pitch <sic> was that these devices were an early concept technology, and used retina tracking and 3D position from transmitters in front of display to transducers on the glasses, to provide augmented reality. Sadly, in reality, this was not the case. Looking through the device, all you could see was a simple text overlay telling you the name of the game. That was it! It was a great disappointment. If I had to be honest, it was the biggest disappointment I experienced at the show. But, am I bitter? No, because I see this as the future of TV. Displays are getting bigger, and viewing sports is a common pastime for TV viewing. Today, it’s impossible to watch football on TV and see a game without those computer generated lines on the field. They greatly enhance the viewing experience. So much so that viewing a game, live, without this enhancement, one could argue is a poorer experience. Can you imagine, some time in the future, watching your favorite sports team on a big screen TV and looking at any player and seeing his name and the stats about his performance hovering over his/her head in alpha-blended glory, and then, using your remote, clicking through other related stats and meta-data on the player? I can, and so can the Terminator (“That’s a nice bike”). Honestly, this is the kind of augmented reality that I really want from devices like Google Glass. In its current implementation, Google Glass is just a funky display, and I have no need for one. But, once they turn them into augmented reality cyborg devices, I’ll probably get one. There were a couple of pieces of cool technology I happened to walk past on my brief visit (I’m sure there plenty of other cool devices; sorry if I missed yours). 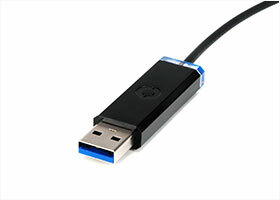 Corning were showing a very neat fiber optic USB 3 extension cable, with a cute name of USB3.Optical™ Rather than being restricted to a few feet, these cables can reliably transmit data dozens of meters. The cable itself is a clever hybrid, with a fiber optic core, and the insulation around the core contains some very thin copper wire to transmit the small amount of power needed to drive the female end (only the male end requires power). The cable is thinner than a standard all copper cable too, and even with the fiber has a very tight bend radius. I understand they also make Thunderbolt, and Thunderbolt 2 cables. 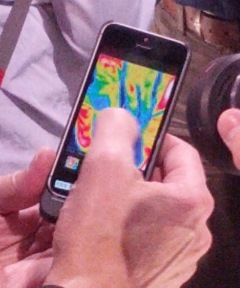 FLIROne is an add-on attachment for your iPhone that provides thermal imaging capability (and for significantly less than the least expensive stand alone devices that are on the market). 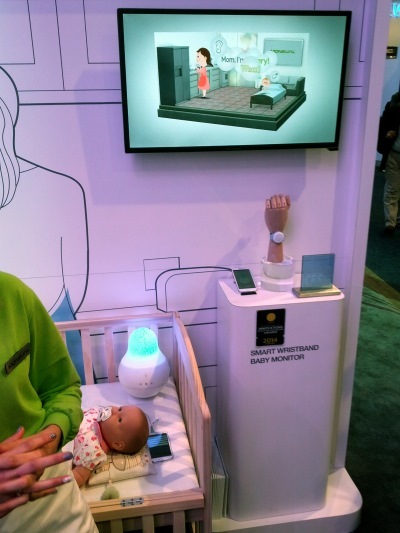 Somebody was showing a device you place in your newborns crib and it monitors and analyzes the crying your child makes (Is it crying because hungry, or awake?!?) It talks remotely to your smart phone and allows you to, for instance, send a music track through to the crib if you determine your child is crying because it woke up, and you don’t even need to get up from your chair! How sad is that? Children cry because they want attention, love and human contact. If your child cries, please pick him/her up; don’t type commands into an app! Sad. Smartphone accessories were everywhere. There were an immense number of booths with every kind of smartphone case imaginable (colored, plastic, rubber, waterproof, bejeweled, wooden, textured …), and similarly for tablets. Showing how important smartphones are to our everyday lives, some of these cases have built in booster batteries to augment their internal capacities so you don’t run out during extended use. Other battery enhancers/rechargers were on display too, such as larger external battery packs, solar chargers, and even a hand-cranked charger. Docking/charger stations were also popular (in a wide range of creative designs and styles), most with built in speakers for turning your device into a boombox. What do you get the person who has everything? 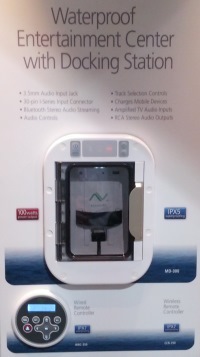 How about a waterproof docking station for their watercraft to allow them to both charge their phone and play tunes from it at the same time. 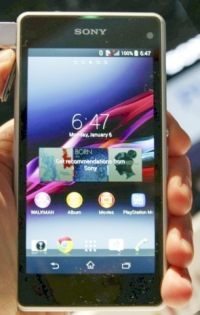 Sony’s Xperia Z1s looks like quite a neat little phone. Nice display, waterproof, good camera, good battery life, fast processor, and a compact little size. What is the plural of Oculus? I think it is Oculi. 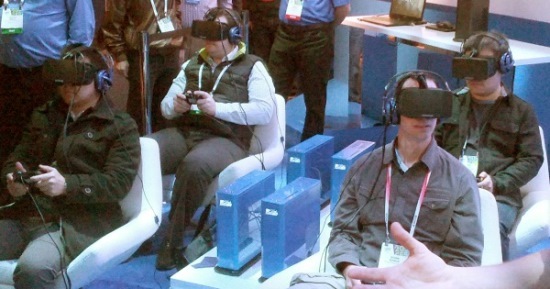 Here are a group of people enjoying and previewing the next generation Oculus Rift HD. (Higher resolution and lower latency). Nvdia were showing a couple of things from opposite ends of the spectrum. 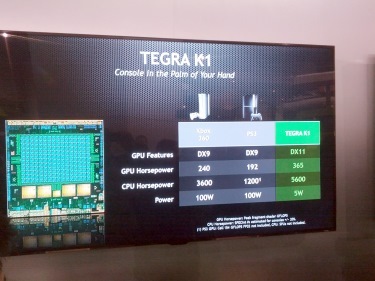 At the other end, they announced the TEGRA K1, a new chip for mobile applications. This 192 graphics core device has more processing power than an Xbox 360. That’s quite an impressive amount of power to stuff into a tablet or mobile device! 3D printers were everywhere, including this little device on wheels, which printed whilst being driven about! There were so many devices and it was pretty hard to distinguish between them. Sadly, the ones that got the most interest seemed to be the ones that had printed out the fanciest models/samples early (which really isn’t the best thing to judge them on), instead of any more scientific basis. Because printers take a little too long for live demos, it’s the finished product that does the selling. Advice to manufacturers for next year; print out your fanciest demo models for the show. This technology has passed the crawling stage, is mature, running and growing strong. It’s no secret that smart phones are eating the breakfasts (and lunches) of the typical DSLR market place. The only people who purchase these high end devices today are professionals and the pro-sumers. I don’t want to start a Nikon/Canon war, but if you judge the brand perception based on the quality/size of their CES booths (a bizarre argument at best), then Canon has won the war; Their booth was very impressive. Helicopters (typically quad bladed), with camera payloads where there in plenty, and these were being pitched as hobby/toys/semi-professional devices. These were not military grade (or Amazon Prime delivery grade), and all the devices drew crowds when they were being operated (safely inside meshed arenas at the show). Yes, there are lots of wearable devices on display (there was even a dedicated section for health devices). I have my own person opinion about Smart Watches, but I’ll try to not let that influence my comments. The smartwatch/band which is a device in of itself. These run an OS, and seem to drink batteries like a thirsty man on a hot day. These need to be charged religiously each day, just like your smartphone. (In fact, some of them are just that, smartphones). The other category is the activity monitor. These are paired with your phone, either synchronously (real time), or asynchronously (downloaded after the activity). There were a whole slew of activity sensors devices on display. 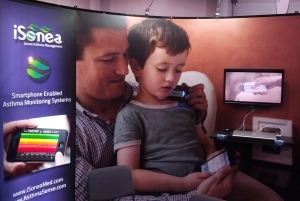 I even saw a microphone device for measuring wheezing to monitor asthmatic patients. (I heard mention of a paired toothbrush that records how long and the type of brushing you do and sends details of this to your phone. I did not see this device, or hunt it down. If I had seen it, it would have been another contender for ‘saddest thing seen at the show’). 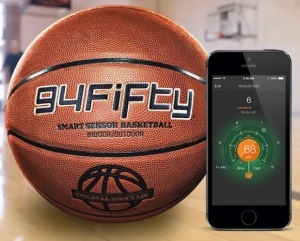 If I played basketball, I bet I'd probably buy one of these. 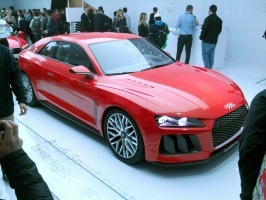 Cars have become the next mobile development platform, and this will be a battleground in the next few years. The smartphone battle is nearing saturation (we’re approaching the point, in the US at least, where smartphone adoption slowing down; there are no barriers to getting one. Anyone who wants a smartphone has options and they are easy to obtain). This is not the case in automobiles. Other than the high end cars (or very new ones at least), very few cars have smart processing power baked in. IMHO this will change rapidly in the next few years. As I mentioned in my blog posting about Smartphones/Dumbphones, I hope the trend will be for auto manufacturers to do this using some kind of smart mirror technology, but realistically, I suspect the big players will want to try to make deals to land grab market share and work to bake their OS directly into the car. 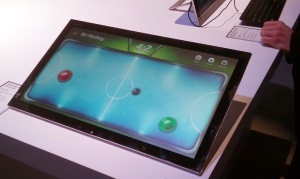 As mentioned above, I really liked the new Samsung devices, but I also found this Rubeus Hagrid sized tablet on the Sony stand that was pretty fun to play games on. Before the show, I heard hype and froth about a couple of things that I expected to see more prominently at the show. This is not to say they were not there, but I just didn’t run into them. The first was external game controllers for smart phones. Now that our smartphones (and tablets) are powerful gaming machines, the thought is that there will be a big market for external controllers (just like the ones that consoles use), which can be paired to your tablet, so you can take your gaming with you. I really did not see any. The second was the mention that we’d a few (sub $500) Steam Box devices on display. I didn’t see any. Steam Boxes are Valve’s bid to enter the console wars. They are PC based (but not Windows) dedicated gaming devices. Time might prove me wrong, but I don’t see the market for these cheap devices. PC gaming is not dead; it’s a very healthy market. Valve and Steam have a very loyal fan base of PC gamers. However, pitching a cheap Steam Box (IMHO), is aiming for the wrong end of the market. You typical PC gamer is a real game junkie, and is obsessed with quality, graphics resolution and frame rate. A PC gamer is more likely to spend $500 on a super-high end graphics for their existing PC than plonk down this amount of cash for a dedicated box that probably has just the same graphics performance as their existing rig.